No, not since 1809. I’m pretty sure the reunions began in the 20th century. 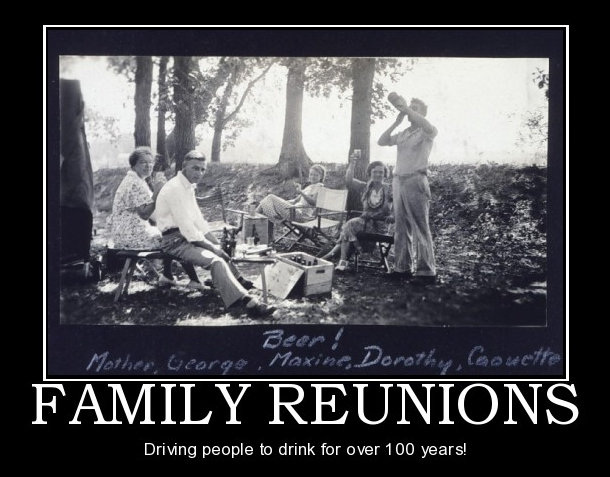 Still, Hubby’s family has hosted a reunion since well before I joined it, so it has that going for it. I think. Anyway, this past weekend was especially fun, since my sister-in-law came down for a visit and attended it as well. It was fun, but also very bittersweet. The group was smaller, and some were older, and others gone on. Remembering them was especially hard for some of us that had not attended the reunion in the past few years, but it was also a chance to make resolutions to not let time go by and try to keep in touch with extended family. It was also a chance to learn new things. The EPA has only 200 armed agents in its Criminal Division. Play-Doh™ colors fade after a few months. One is never too old for Play-Doh™. Lemon pound cake is the equivalent of crack. First dibs is totally legal. Memories become sweeter with time. But most important, Time never stops for anyone. I still live with the regret of waiting to connect with someone because “there’s always next year”. Yes, next year is sure to come, but one isn’t guaranteed the chance. Don’t wait to do tomorrow what you can do today. This entry was posted on Monday, June 30th, 2014 at 9:33 AM	and tagged with blessings, hard-things, live-like-you're-dying, ties-that-bind and posted in Family, Funnies. You can follow any responses to this entry through the RSS 2.0 feed. “There’s paper plates for that.” Or, as we referred to them in my family, Mrs. Douglas dishes. If any of you young people do not get the reference, let me know, I’ll fill you in. Eva Gabor’s character “Lisa Douglas” on Green Acres. Her idea of doing dishes was to throw them out the kitchen window into a barrel. She went through a lot of good china on that farm! In any case, we referred to throw-away dishes as Mrs. Douglas dishes. I miss family reunions. Aunt Bendina was always the one that organized them. I always found family reunions to be a mixed bag, in general. We had a Fourth of July gathering – lots of family, and my daughter met her great grandmother, her namesake. We finished dinner and went for pie. Someone asked grandma what kind of pie she wanted and she keeled over of a stroke. She never woke up. You might think “Oh, that is horrible!” But if you look at it the other way, we had an awesome day together and being with five generations of family in one place is pretty amazing. I saw her nearly every day of my life growing up and still that day was a top one for me. So much family enjoying her company.